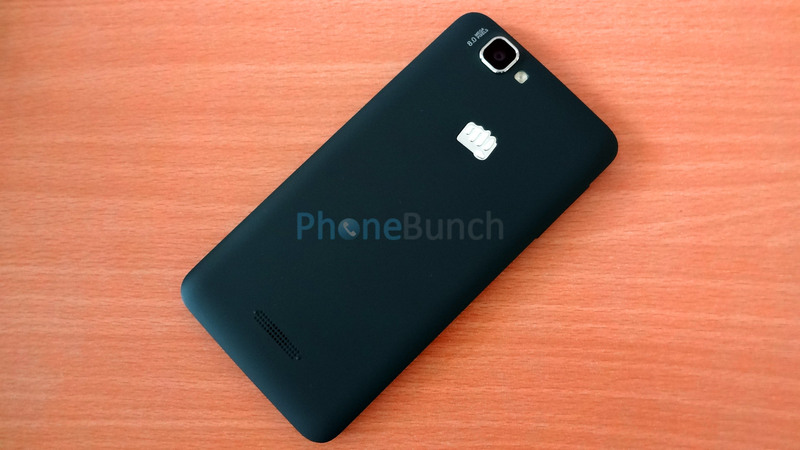 Micromax launched Canvas 2 Colours A120 with excellent specs for a brilliant price-point of Rs. 10,500. It comes with a 5-inch HD display, quad-core MediaTek MT6582 processor with 1 GB RAM and moreover you get two replaceable back-covers within the box. 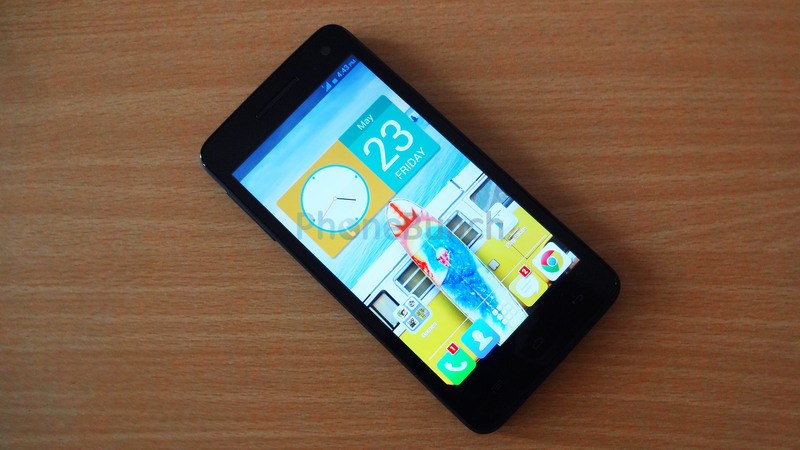 The Canvas 2 Colours runs Android 4.2.2 Jelly Bean but comes with a guaranteed KitKat update. 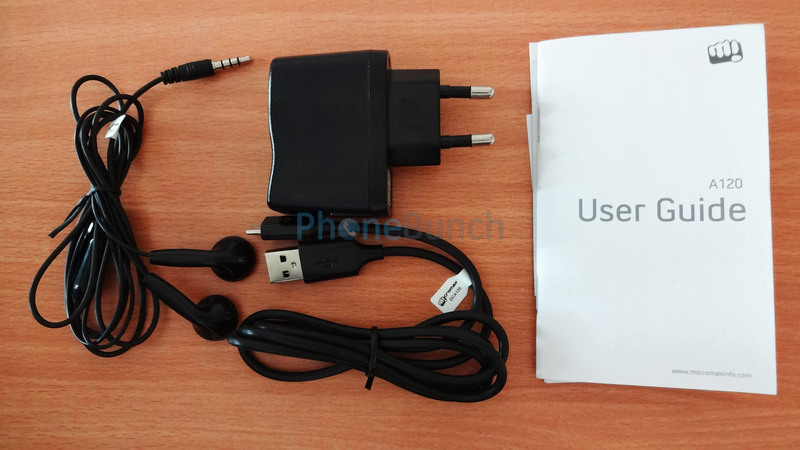 Inside the box you get the regular accessories including a charger, USB data-cable, battery as well as a headset. We got the black/grey color which comes with a Blue(Turquoise) and a Yellow back-cover within the box. The Canvas 2 Colours is quite well spec'd considering it comes with a quad-core processor, a 5-inch HD (720x1280 Pixels) IPS display which is a first for the segment with 1 GB RAM running Android 4.2 Jelly Bean and a guaranteed update to Android 4.4.2 KitKat. MediaTek's MT6582 powers the innards with Mali-400MP2 GPU. There's a 2000 mAh battery powering the phone alongwith a 8 MP AF camera at the back. 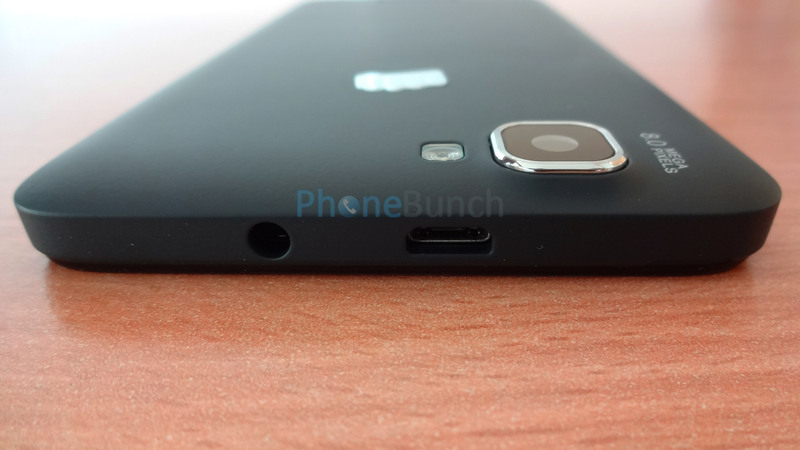 There's a LED flash as well alongwith a 2 MP front-facing camera. The 8 MP rear-camera is capable of recording 1080p videos at 30 FPS. You get 4 GB internal storage out of which about 2.6 GB is available to the user which is expandable upto 32 GB using microSD cards. You also have proximity and light sensors alongwith an accelerometer. WiFi Tethering, Bluetooth and USB Tethering are also supported. USB OTG is also supported. Overall the build of the device is surprisingly quite solid. The Canvas 2 Colours A120 weighs in at 168 grams and is 9.7 mm thick. It is 146 mm in height and 74 mm in width. In the front you have the 5-inch IPS display with three capacitive buttons at the bottom, they are visible even when the backlight is off and are quite sharp. There is no backlight bleed through them. Just above the display is the 2 MP front-camera, proximity & light sensors alongwith the main earpiece which also has the notification LED embedded within it. The display is vivid, color reproduction is accurate and with wide viewing angles. The front-panel is covered in a glass/plastic layer which does attract fingerprints. On the left you have the volume rocker which is sturdy and provides good feedback, its made of the same color as the back-cover whichever one you put on the phone. On the right you have the power lock/unlock button. The buttons are reachable easily and apt for single-handed use. At the top you have the 3.5mm audio jack alongwith the microUSB data-syncing/charging port while the microphone can be found at the bottom. All the sides of the phone are covered by the back-panel giving a distinctive design and look to the phone with every cover. 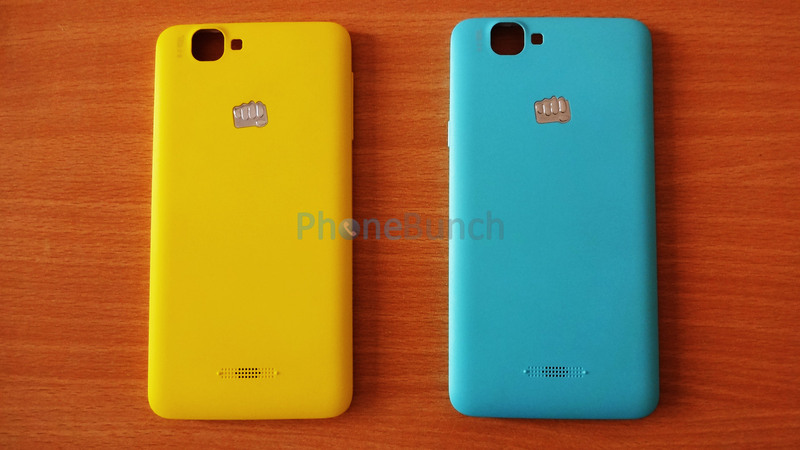 The back-cover has a matte finish which makes the phone good to hold and is quite sturdy. It doesn't bend or flex not even when on the phone. You get a Blue/Grey back-cover on the phone with the additional two inside the box. All three are made of the same material and are equally sturdy. You have the 8 MP camera as well as the LED flash at the back, just below it is the Micromax logo and the speakerphone at the bottom. The speakerphone has two raised hoofs on its sides so that it is never in contact when phone is placed on a flat surface so that it doesn't get muffled. On opening the back-cover you are greeted to two full-size regular SIM card slots alongwith the microSD card slot to the right capable of using upto 32 GB of storage. Just below is the battery compartment to house the 2000 mAh battery. The build as I said earlier is quite sturdy and the attention to design is clearly visible on the Canvas 2 Colours. 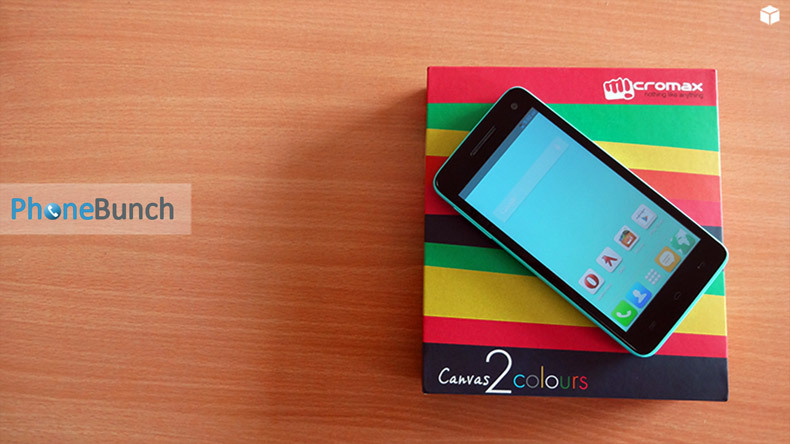 The Canvas 2 Colours A120 comes with good build, a sharp/vibrant IPS display and a fast quad-core processor. Seems like a recipe for success at about Rs. 10000. Well, it might just be. In our time with the Canvas 2 Colours we found that it performs quite well, the display has good touch response, the UI has been customized somewhat which is visible with the first look at the homescreen. It also comes with Smart gestures like the Canvas 2.2 A114. In terms of overall performance, build, features, accessories and price at present there is none to compete with the Canvas 2 Colours.